Lutalo Masimba was born in the East Dry River area of the Trinidad capital of Port of Spain, , the man known today is better known as Brother Resistance, the most acclaimed and active founding elders of rapso. Brother Resistance's 1980 hit "Ring De Bell" was rapso's breakthrough call to arms. The bell, and the refrain of “Ring it all over / Ring de bell down dey”, is used to draw attention to the need for justice, freedom and other human rights issues. As a young boy, Brother Resistance was told by his teacher that what he was writing was not to be considered poetry so early on he understood that he would create a new form, a new tradition for himself and others who did not fit the narrow definitions of poets outlined by a British system. Working a series of menial jobs after graduating from high school Brother Resistance continued to be drawn to music. "RAPSO is a unique style of street poetry from Trinidad and Tobago which draws on the musical experience of the Shango/the Kaiso (Calypso) and robber-talk (a Carnival Theatre) / The Steelband and some have described it as Soka-Poetry or Poetry-in-Soka, but the Rapso Poet has resisted all such labels. "Rapso" is a term originally coined by Network Riddum Band of East Dry River, Trinidad. "RAPSO has its historical roots in the ancient African traditions of the GIROT. Therefore the practitioner of Rapso is considered as the vessel of speech, the storehouse of knowledge and history, the teacher and communicator for this new generation. The rapso poet—man, woman, person—is one who lives and practices the art of RAPSO. RAPSO is living street theatre. He assumed the leadership of the Network Riddim Band by 1970. Eventually he earned a bachelor's degree with honors in economics and history from the University of the West Indies, all the while continuing to chant and write his own songs, switching to electric music by the mid-'70s. Throughout the seventies he continued to chant and write his own songs, switching to electric music by the mid-'70s. Following the release of their debut album, Busting Out, in 1981, Brother Resistance the Network Riddim Band returned to Trinidad and Tobago at the request of Prime Minister Dr. Eric Williams. The musical experience which fuelled the new art form of Rapso came from the rhythms of the street, the steelband yards, the drum yards and the calypso arena of Port of Spain, Trinidad. The movement maintains its Carnival roots through its celebration of colorful characters who only become larger than life during the Carnival season. The vibes and the flavour harkens to a social movement of a people striving for true liberation and self determination. This is food for both the soul and spirit. It was the Network Riddum Band that coined the term rapso. Since then Brother Resistance, also known as Lutalo Makossa Masimba, has gone on to become one of the Trinidad's best known and most widely toured rapso performers. Brother Resistance along with Karega Mandela and Brother Book, was instrumental in establishing a day of celebration for rapso in Trinidad and Tobago. In 2007, both organizers and audience were blown away by the Rapso performance delivered by a fan and patron in attendance, the legendary cricket player Brian Laura performed impromptu a ditty from his school days. Rapso is the sound of the youth vibe...the consciousness of Soca, the poetry of Calypso. Rapso is the voice of the ancestors, the opening for storytellers, the queue for Carnival characters. Rapso is the light to the dark shadow of today's hip hop misogyny. Although it was not known at the time, Lancelot Layne's 1970 hit Blow Away was the first rapso recording. Layne is also well remembered for his 1971 recording Get off the Radio. 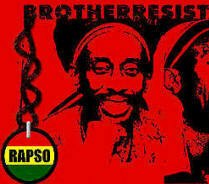 The term Rapso was not coined until 1980 by Brother Resistance and his band's breakthrough hit "Ring De Bell." Drawing on the folk traditions of the Carnival characters of Trinidad and Tobago Lance recreated the vibes of the "Chantuelle", "Pierot" and "Midnight Robber" to establish the reality of what is today called Rapso. The 1990's gave birth to a new generation of young rapso artists who combined the positive messages of rapso with dance rhythms. 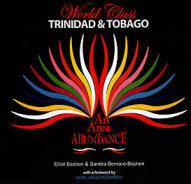 Among these groups, is a rare gem, who are the toast of their motherland of Caribbean Carnival culture, 3 canal who won many fans in their 2002 Northern California tour with appearances at Reggae of the River and Ashkenaz in Berkeley. There are few trios who have ever harmonized with the authority and liveliness of Stanton, Roger and Wendell. 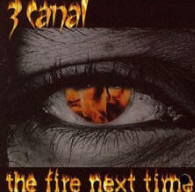 3canal often describe themselves as Rapso soldiers "on a mission to spread the power of the word, the message of Peace Love and Possibility." The never stray but rarely repeat themselves in this mission, beginning their production with a PREAMBLE; quoting Martin Carter, Fritz Capra and the I ching to raise consciousness that the Time of Crisis is also a time to hope for the possible. "The Chinese, who have always had a thoroughly dynamic worldview and a keen sense of history, seem to have been well aware of this profound connection between crisis and change. The term they use for crisis – wei-ji – is composed of the characters for ‘danger’ and ‘opportunity’. Fritjof Kapra - The Turning Point. 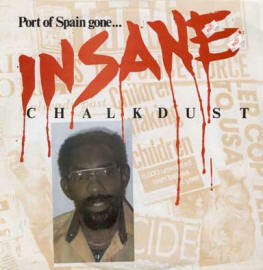 Dr Hollis Liverpool, performs as “Chalkdust”, when he is not educating students as an Associate Professor in History at the University of the Virgin Islands or conducting seminars designed to produce the next generation of social bards by imparting the value of cultural arts in the school curriculum. Liverpool is well known as an engaging lecturer and knowledgeable lyricist who was The Trinidad and Tobago Minister of Culture between 1993 and 1999. Chalkdust has recorded more than 300 songs. He is the eight-time winner of St. Thomas’ (USVI) King of The World contest, the seven-time holder of Trinidad and Tobago’s Calypso Monarch title. Only the Might Sparrow with 8 crowns has won more Calypso Monarch titles, but he no longer competes. He is the author of the books "Rituals of Power and Rebellion: The Carnival Tradition in Trinidad and Tobago" and "From the Horse’s Mouth", a socio-cultural history of calypso from 1900 to 2003. 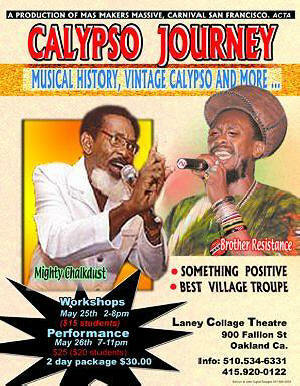 2006 - Placed 3rd in Calypso Monarch competition with "The Bandit Factory" and "Chalkie the Mailman"
Government Training College for Teachers, the University of the West Indies, and at the University of Michigan at Ann Arbor, USA. He holds a Teacher's Certificate, a Post-Graduate Diploma in Education, a B.A. in History and Sociology, an M.A. in History and African History, a Post Graduate Certificate in Philosophy and a Ph.D. in History and Ethnomusicology. Beginning his stellar career as a primary and secondary school teacher, he has also served his native land as Director of Culture, 1993-1999. 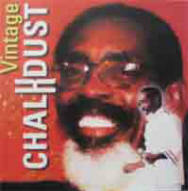 The Mighty Chalkdust comes strong in 2005 and wins the Calypso Monarch title.